Feel relaxed and peaceful nature in buildings during busy everyday life. 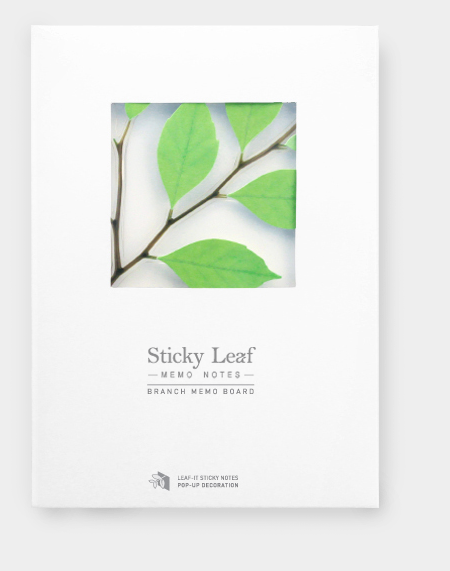 ‘Sticky leaf deco’ is new decoration collection to refresh monotonous routine. It can move the nature around your desk beyond the function of note. 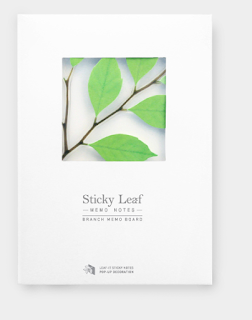 You can keep your precious memo on the Sticky leaf by attaching it on the branch shape memo pad. 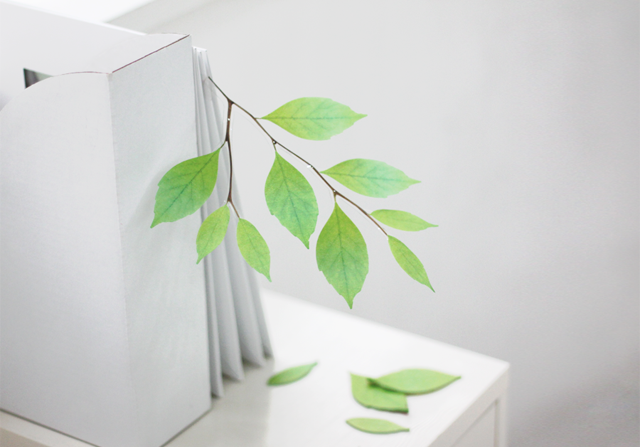 Also, you can feel the beautiful nature from branch and leaves themselves with being unwritten notes. 딱딱한 주변 환경을 바꿔주는 스티키리프_데코는 스티키리프™(sticky notes)의 새로운 데코레이션 콜렉션(collection)입니다. 메모의 기능을 넘어서 내 책상 주변에 자연을 옮겨 놓은 듯 연출할 수 있는 제품입니다. 나뭇가지모양의 메모판에 나뭇잎 메모지, 스티키리프를 붙여 나의 소중한 메모를 보관할 수도 있고, 메모를 적지 않은 나뭇가지 그 자체로도 아름다운 자연을 느낄 수 있습니다. This is a three dimensional and pop-up form to keep your memo specially. 메모를 특별하게 보관할 수 있는 팝업 방식의 입체 형태입니다. 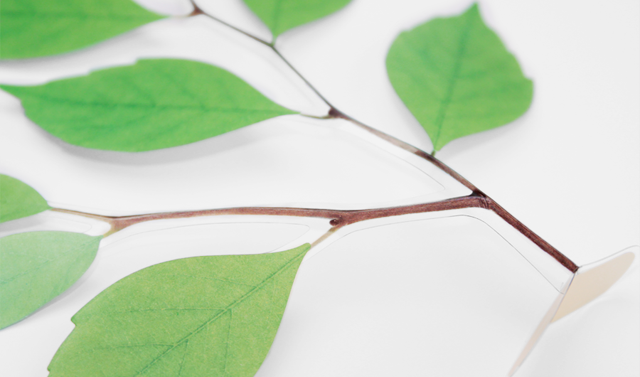 Realistically printed branch shape gives full of liveliness. 나뭇가지 형태가 사실적으로 인쇄되어 생동감이 넘칩니다. 1. Detach from the board. 2. Fold the branch along the middle line of the branch. 4. Make an oval shape by keeping them together to the center. 5. Attach double-sided tape with the oval side. 6. 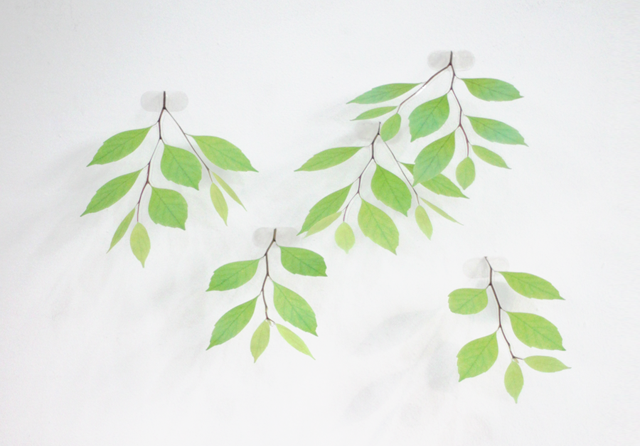 Fold the leaves end to end with branches naturally. 1. 나뭇가지 판에서 나뭇가지를 떼어냅니다. 2. 가지 중앙의 눌린 선을 따라 나뭇가지를 입체적으로 접어 줍니다. 4. 날개를 중앙으로 모아서 긴 타원 형태로 만들어줍니다. 5. 만들어진 타원 형태에 양면테이프를 부착합니다. 6. 나뭇가지와 만나는 잎의 끝쪽을 접어 자연스러운 형태를 잡아줍니다. 1. 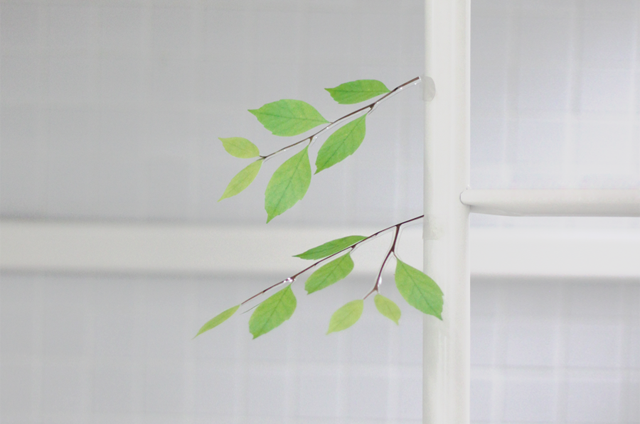 Attach the finished branch on the wall or corner of room. 2. 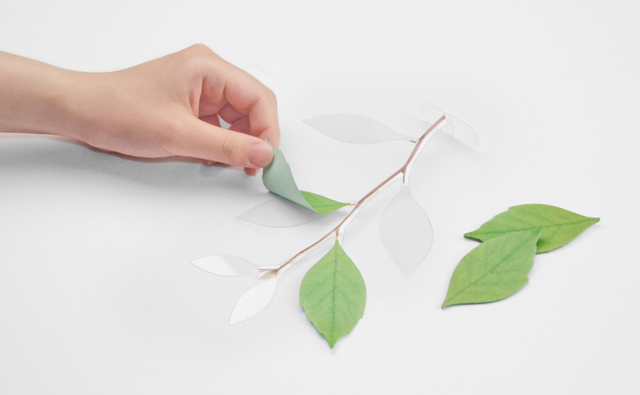 Leave the message at Leaf-it, a leaf shaped memo sheet. 3. 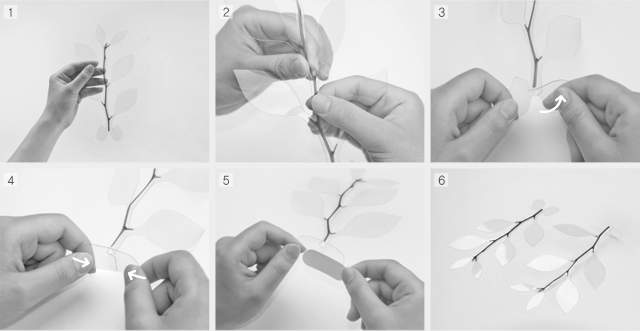 Attach leaves one by one and move the branch up and down to make it naturally. 4. The more branches, The greener your surrounding. 1. 완성된 가지를 벽이나 모서리 등에 부착합니다. 2. 나뭇잎 모양 메모지 리프잇에 메모하세요. 3. 잎을 한 장씩 붙이고 가지를 위아래로 움직여 자연스러운 모양을 연출합니다. 4. 나뭇가지가 많아질수록 주변은 푸르러집니다. 실내에서 시들지 않는 자연을 느껴보세요.